A walk-in closet that is small and isn't the equivalent of 4x4 square amot should have a mezuzah on the right side going from the closet to the room. A walk-in closet that is the equivalent of 4x4 square amot should have a mezuzah walking into the closet. ↑ Aruch Hashulchan 286:12-15 proves that the Bet Yosef's opinion that the bedroom needs a mezuzah and it is sufficient to have it covered with one covering. Yalkut Yosef YD 285:41 and Halichot Olam v. 8 p. 302 agree. Ben Ish Chai (Shana Sheniya, Ki Tavo, no. 16) writes that such is the minhag. ↑ The Gemara Yoma 10a establishes that according to the rabbis a sukkah does not require a mezuzah since it is a temporary dwelling. The Tur YD 286:11 extends this to a boat and store that are also considered a temporary dwelling which doesn't require a mezuzah. The Shulchan Aruch 286:11 concurs. The Taz 286:10 explains that even if the store is used every day it is exempt since no one lives in it at night. He adds obviously that if someone has a store in their house they require a mezuzah. However, the Perisha 286:22 wonders if store nowadays are exempt since they are permanent. In fact, the Pitchei Teshuva 286:14 cites the Yad Ketana who argues that a store that is set up for a temporary marketplace for a week or so is exempt from a mezuzah, but an established store requires a mezuzah. Yalkut Yosef YD 285:36 agrees. See further Yabia Omer 10 p. 350 and Halichot Olam v. 8 p. 302. Yalkut Yosef writes that a mezuzah should be put up without a bracha because of the dispute but if someone recites a bracha they have what to rely upon. The Ohel Aryeh 4:8 writes that perhaps the Taz would agree nowadays since the stores are open partially into the night and since it is used by day and night it is considered permanent. According to Rav Hershel Schachter the rules are ordered 1, 2, 3, 4, 5. According to Rav Moshe 4:43 the rules are ordered 1, 2, 4, 3, 5. Teshuva M'ahava 1:61 agrees. According to Chelkat Yakov 161 the rules are ordered 1, 2, 3, 5, 4. According to Daat Kedoshim 289:11 the rules are ordered 1, 2, 5, 3, 4. ↑ Binyan Tzion 99 writes that a door from a place that isn't obligated in a mezuzah to a place that is obligated in a mezuzah should have a mezuzah on the right side going from the place that is exempt to the place that is obligated. His example is the closet that is less than 4x4 amot which is seen as an entrance from the closet to the room. Also, a front door to the street certainly has a mezuzah from the street to the house. 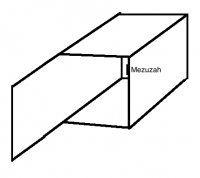 Rav Hershel Schachter in “The Laws of Mezuzah” (min 34-42) explained that this is the first factor by which a person determines on which side of the door the mezuzah is placed. The Levush 289:3 writes that the side rooms of a house which open to the main room which was warm in the winter should have a mezuzah going into the main room since it is used more than the side room. This rule trumps the direction of the door. This is accepted by the Shach 289:6 who comments that it is obvious. The Kitzur Shulchan Aruch 11:4, Chayei Adam 15:18, Chelkat Yakov YD 161, Rav Hershel Schachter in “The Laws of Mezuzah” (min 34-42), Igrot Moshe 4:43:4 and Hamezuzah Vehilchoteha 11:11 agree. ↑ The Maharil (responsa 94) wrote that if the back door opens into a backyard that has a gate to a street then the direction of the mezuzah is determined by which way the door opens. Taz 289:3 quotes it. Chelkat Yakov YD 161 writes that even though the Maharil writes that when there are two doors to a backyard the mezuzah is determined by the way the door opens, the Levush holds that we would put up the mezuzah going into the house since it is used more than the backyard. Furthermore, the Bet Meir and Chavot Daat disagree with the Maharil altogether even when the backyard has no other exit. Therefore, the Chelkat Yakov concludes that since the house is used more than the courtyard that trumps the rule of the fact that the majority of the walking is from the house to the courtyard. Rav Hershel Schachter in “The Laws of Mezuzah” (min 34-42) agreed. ↑ This is the equivalent case of the room that is a dead end with no other entrance. See above by rule #2.